This year’s sunglasses are not just about what suits your face shape, this year the trend is all about style and exuding your personality through the latest eyewear trends. From the catwalk to the high street the trend is all about bold style statements for all frame shapes and styles. There are less of the oversized frames that have been around for a number of seasons now, there are colours and textures, embellishments and patterns for everyone but smaller frame styles. This year the trend has more of a nod back to the styles of the 1980s, 1990s with more shaped and angular frames such as those available on the high street, including the cat-eye style at Top Shop or the heart rimmed glasses at Urban Outfitters, perfect for the fashionista’s. The first thing to realise however is this season, there is less and less of the heavily mirrored lenses that celebrities have been sporting in recent years, there is more of the muted colour pallet of lavender and pale blue lenses. Mirrored lenses still have a place but a more lighter silver tone. Metal frames will have a huge prominence this year, but not just the classic aviator style that has been so dominant in recent years. The metal frames styles are much thicker and include a lot of premium metals such as titanium, there will be a mixing of metals with woods and acetates. 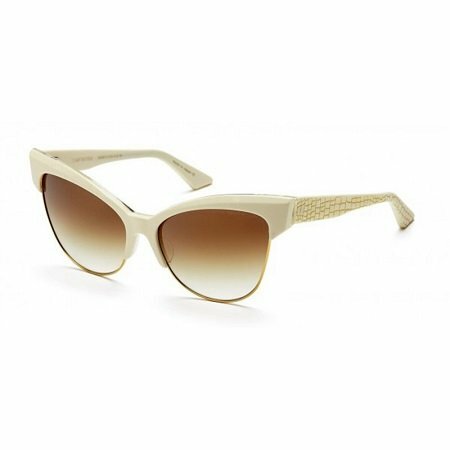 Dita sunglasses are a classic example of this season’s style. Celebrities, the paparazzi have already picked up on this brand which is distinguished by its modern shapes and mixing of materials, creating a high-end style. This brand has captured all styles and shapes as well as the materials and colours that are popular for the season ahead. The Temptation glasses are a key example of the blend of styles and shapes that are popular this season. The reintroduction of the general style from Ray-Ban has been met with a positive reception this year, a style reminiscent of the aviator but the general Ray-Ban has a double bridge and military inspired rims and lenses. This style encompasses the metals, the lenses and the shape of the 2017 season. If metal frames are not really your style then the angular and shaped trend continues into bold colour, chunky acetate glasses, like those spotted at Mulberry. Another popular style is any frame finished in a tortoise-shell print for 2017, as inspired by the catwalks of Miu Miu. Or for those of you that dare, heavily embellished frames such as those seen by Dolce & Gabbana and Gucci two brands never to be outshone when it comes to a bold style statement. 2017’s style is about well-fitting and sleek sunglasses, or bold statements, with a completely flat rim to the face rather than a more classic rounded style of sunglasses. Rose gold will still be a popular rim colour choice as will other metals. These metallic frames will be balanced with a muted lens or a thicker metallic lens in a much more angular frame. Whatever the style 2017 is a good time to invest in a new pair of summer’s most essential accessory! Frame your personality – with this year’s most stylish sunglasses!